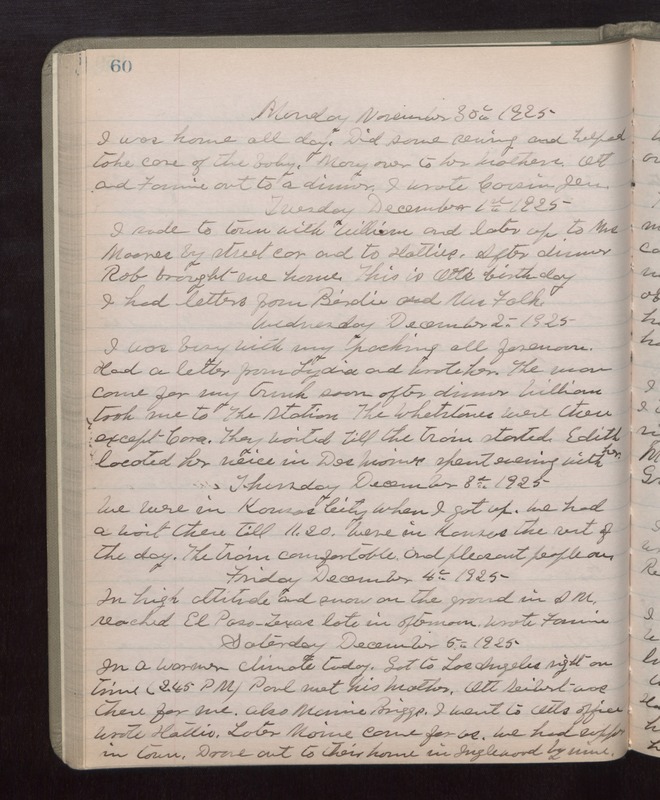 Monday November 30th 1925 I was home all day. Did some sewing and helped take care of the baby. Mary over to her Mothers. Ott and Fannie out to a dinner. I wrote Cousin Jen. Tuesday December 1st 1925 I rode to town with William and later up to Mrs Moores by street car and to Hatties. After dinner Rob brought me home. This is Otts birthday. I had letters from Birdie and Mrs Falk. Wednesday December 2nd 1925 I was busy with my packing all forenoon. Had a letter from Lydia and wrote her. The man came for my trunk soon after dinner. William took me to The Station. The Whetstones were there except Cora. They waited till the train started. Edith located her neice in Des Moines. Spent evening with her. Thursday December 3rd 1925 We were in Kansas City when I got up. We had a wait there till 11.20. Were in Kansas the rest of the day. The train comfortable and pleasant people on. Friday December 4th 1925 In high altitude and snow on the ground in AM. Reached El Paso Texas late in afternoon. Wrote Fannie. Saturday December 5th 1925 In a warmer climate today. Got to Los Angeles right on time (2.45 PM). Paul met his mother. Ott Seibert was there for me. Also Maurice Briggs. I went to Otts office. Wrote Hattie. Later Maime came for us. We had supper in town. Drove out to their home in Inglewood by nine.